The Birmingham cricketing legend who introduced helmets to the game said the "freakish accident" which killed Australian Phil Hughes showed more needed to be done to keep players safe. The much-loved 25-year-old international died last week after being struck by a short-pitched delivery, sending world cricket into mourning and raising questions about the safety of the sport. It was particularly poignant for Dennis Amiss, the Harborne-born England star who introduced the helmet which went on to change the game in 1977. Mr Amiss was also present at the another high-profile tragedy, when New Zealander Ewen Chatfield came close to dying on the pitch, but he said players today were safer than ever. He said the game, and particularly helmet manufacturers, should learn lessons from the tragedy which would better serve players of the future. "It was a freakish accident but if we can improve helmets further it might just save a life," he said. "There are improvements that they can make – mainly by taking the back of the helmet down a bit. People are going to look at it now and give it a great deal of thought about how they can make it better. "Nobody wants to see things like this happen and we have to do everything we can to ensure they don&apos;t."
Phil Hughes was this week remembered at a funeral in The New South Wales town of Macksville which was attended by thousands of fans and fellow cricketers. His captain Michael Clarke choked back tears when he spoke about his friend and said: "Rest in peace my little brother, I&apos;ll see you out in the middle." 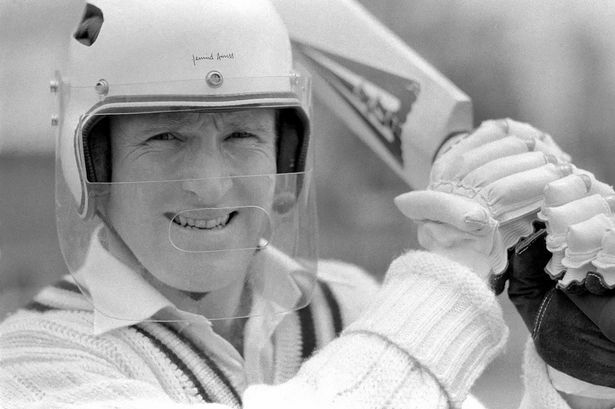 Mr Amiss, who went on to become chief executive of Warwickshire CCC after 27 years of service at the club, changed cricket forever after wearing a customised motorcycle helmet in the World Series of Cricket in 1978. He said he was minded to wear it after a summer of facing legendary Australian bowlers Dennis Lillee and Jeff Thomson and stood to face 18 people there that could bowl 90 miles an hour in the legendary series. He said: "It was a helmet make of kevlar with a polycarbonate visor which was very big and heavy. It wasn&apos;t the solution but it did give protection. "We quickly saw that it wasn&apos;t going to be a total answer and over time it became more like a cap with a grill on. It improved over the years and suddenly all of the players were wearing them. "It did improve over the years but you are never going to be able to cover every part of the head." Australia stopped this week as Phil Hughes was given an emotional send-off as the batsman&apos;s funeral was screen throughout the country. Meanwhile, an immediate investigation has been launched to see if there is more to be done in protecting players at the crease. However, Mr Amiss said that short-pitched bowling, even at speeds of more than 90mph, and the bravery it entails to face that, remained a key part of the sport. He said: "The short ball is part of the fast bowler&apos;s armoury. There are some controls – you can only bowl one an over – but it is part of the sport. "I feel for Sean Abbott, the bowler. Whether he can come back from this and go on to be the bowler he promised to be is a big question mark. These things can happen. The game has to have an element of bravery – standing up to fast bowlers is part of cricket. "We protect as much as we can but you are never going to stop short-pitch bowling unless lots of things like this happen but this was a one-off." Mr Amiss was on the pitch when another high-profile tragedy occurred – a serious head injury to New Zealand bowler Ewen Chatfield in a Test match against England in 1975 season. English fast bowler Peter Lever decided to test Chatfield with a bounce and struck him on the temple, rendering him unconscious and not breathing after swallowing his tongue and had to be resuscitated with heart massage. Mr Amiss said: "Bernard Thomas, our physio, didn&apos;t come with us to the game and when Ewen Chatfield started to turn blue there wasn&apos;t anyone out there who could help him. I have a picture at home and we are all praying. "We were going to lose a player and we were screaming and shouting and it turned out Bernard Thomas had just arrived in time and he recovered from the incident."